There are millions of websites over the web and similarly the trend of blogging is increasing. In the coming years, I think blogging will be considered as the prominent branch of computers or something closely related to computers. The numbers of bloggers are increasing rapidly as one can express their views, share tutorials, the good and the bad experiences of life with everyone over the web. One can host a blog on a free platform like Blogger (Experts Galaxy is hosted on Blogger) or can host on self hosted Wordpress. 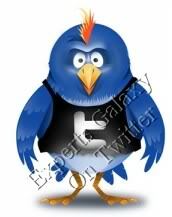 Anyhow, you need to make sure that your blog or website should be available everytime. Everyone is not a full time blogger and even the full time bloggers do not open their blogs again & again to check if it is working properly or not. 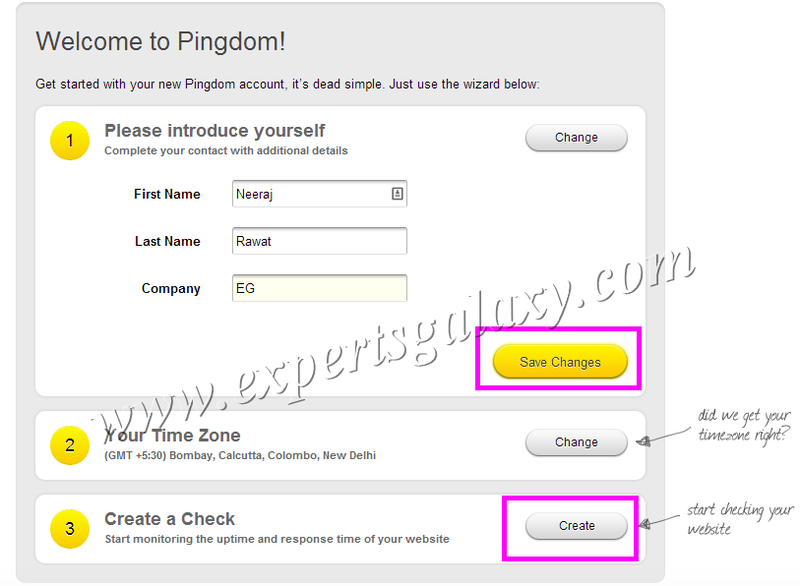 In such scenario, sites like Pingdom will be helpful to monitor the performance of blogs. On the next page after logging, it will show the welcome form where you can fill up the details and then click on save changes. You can also change the time zone if it does not detect it, correctly. After that click on create at step number 3 for creating a check for your blog or website. Fill up your domain details where you have setup the website or blog along with the alert settings, where you would like to receive the alerts regarding the downtime. Once you fill up everything as desired, please click on create check button at the end of the page. 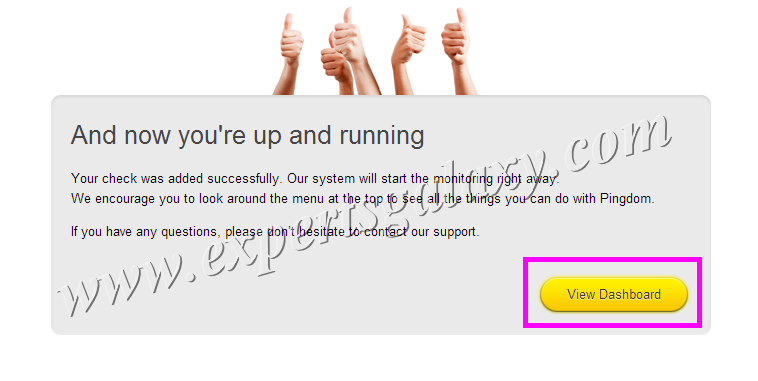 After that it will show the check successfully created message and you are ready to visit the dashboard of your account. You can see the created check in your dashboard and can refer it for the uptime and downtime of your blog. In case a downtime occurs then you will get an email (You can setup the frequency of email report) or an alert as setup by you. I have been using their free account for a long time and it works fine however it seems that there is an issue with their SMS alert service as I never received an SMS regarding the downtime of this blog. Today only, I changed their recommended SMS provider which is Nexmo to BulkSMS and was able to get a test SMS. 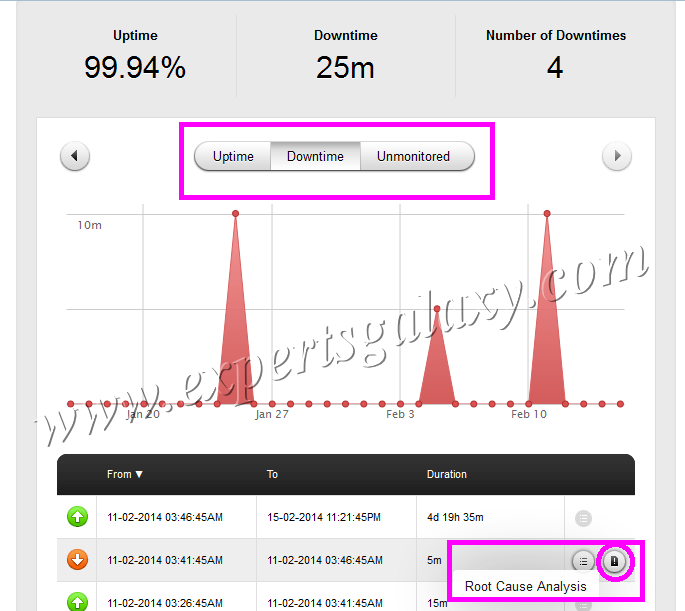 You can also check the root cause of the downtime by visiting the "Reports" option at the top and then "Uptime Report" under it for your created check. This blog is hosted on Blogger rather Google servers so rarely I see a downtime as per them and as per my experience. Though you can use their services to monitor your websites hosted somewhere else but their free account can be used only for one domain. 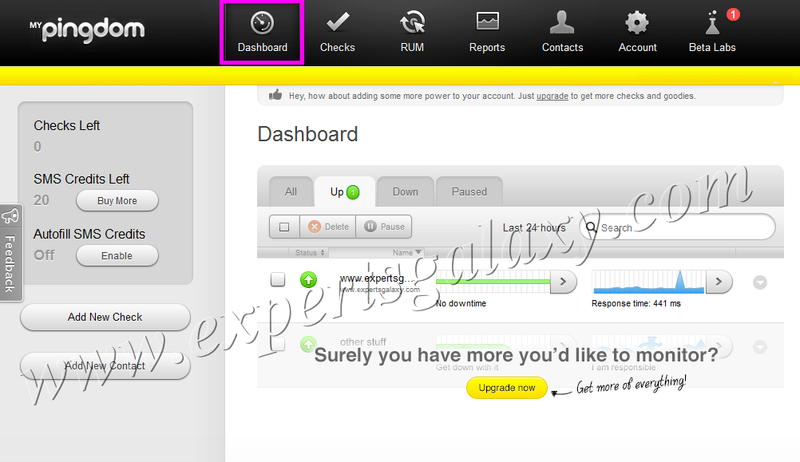 So, as a whole you can create only one check in your free account but you can upgrade it anytime as per your need. If you know about any such site or service offering free service then do let us know so that we can share the same with our readers. I checked one more site today and would share the same after testing their service for some time.